"Jasmere seeks out lesser-known specialty retailers that deserve national attention. Our team of New York, Los Angeles and Washington, DC- based shopaholics personally tests every product we feature, using jasmere's negotiating power to offer you an exclusive discount. But don't let the low prices fool you. Every merchant we feature on jasmere meets our highest standards of quality. You may not have heard of these websites, but you can be sure their products and services are the best around. We guarantee it." Basically, vouchers are given at a huge discount, and the more people who purchase the vouchers, the steeper the discount. Credit cards are not charged until the sale has ended. I've already seen the price for today's sale go down within the past couple hours. So, check out this fun site, and if you're so inclined, purchase some vouchers for Maple Landmark Woodcraft. I've already bought a couple! 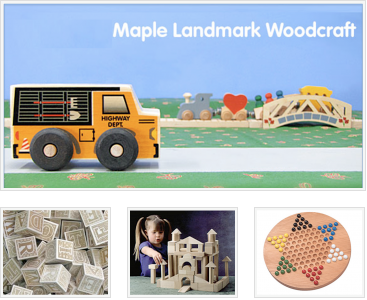 $50 Maple Landmark Woodcraft Gift Certificate for only $19 (and price may still drop)! Deal ends at noon tomorrow!